The vires of S.364A of Indian Penal Code is challenged before the Supreme Court on the ground that the section which makes kidnapping for ransom an offence is itself unconstitutional being violative of Articles 14 and 21 of the Constitution. 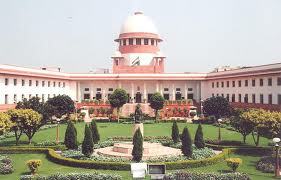 Though the two Judge bench of Justice T S Thakur and Justice S J Mukhopadhyaya felt that the appellants who have been sentenced to death by hanging under Section 302 and 364A of the Indian Penal Code have taken a chance with a petition seeking review of their conviction, not because anything grossly erroneous is pointed out about the conclusions arrived at by the Courts, but on the ground that Section 364A of the IPC which makes kidnapping for ransom an offence is itself unconstitutional being violative of Articles 14 and 21 of the Constitution. The Bench finally referred the matter for the consideration of the larger Bench. Writ Petition (Crl.) 15177 of 2012 was filed by Vikram Singh for a declaration that Section 364A inserted in the Indian Penal Code by Act 42 of 1993 w.e.f. 22nd May 1993 is ultra vires the Constitution to the extent the same prescribes death sentence for any one proved guilty. He also prayed for a further writ quashing the death sentence awarded to him by the trial Court, upheld by the High Court, and finally affirmed by Supreme Court in Criminal Appeals No. 1396-97 of 2008. A mandamus directing commutation of the sentence awarded to the petitioners, to imprisonment for life was also prayed for. The writ petition was later withdrawn with liberty to the petitioners to file a writ petition before the jurisdictional High Court. A Division Bench of the High Court of Punjab and Haryana has, upon consideration, dismissed the petition by its judgment and order dated 3rd October 2012 which is impugned in the appeal. 364A. Kidnapping for ransom, etc.Whoever kidnaps or abducts any person or keeps a person in detention of the such kidnapping or abduction and threatens to cause death or hurt to such person, or by his conduct gives rise to a reasonable apprehension that such person may be put death or hurt, or causes hurt or death to such person in order to compel the Government or [any foreign State or international inter-governmental organization or any other person] to do or abstain from doing any act or to pay a ransom, shall be punishable with death, or imprisonment for life, and shall also be liable to fine. It was argued that Article 21 of the Constitution guaranteed to the petitioners a fundamental right to life and liberty and protected them against deprivation of those rights otherwise than in accordance with the procedure prescribed by law. In order to satisfy the requirement of Article 21 of the Constitution, it was necessary not only that the deprivation was in accordance with a validly enacted law, but also that such law was just and fair. Deprivation of life and liberty on the basis of a law that was either unjust or unfair would, offend the constitutional guarantee contained in Article 21. It was contended that inasmuch as Section 364A of IPC made even a first offender liable to be punished with death, it was much too harsh to be considered fair and reasonable. It was further argued that the provisions of Section 364A are ultra vires also because a simple kidnapping for ransom in which the victim is released without any harm to him/her with or without payment of the ransom demanded for his/her release, is also on a plain reading of Section 364A, punishable with death without there being any guidelines in Section 364A for the Courts to follow while determining the quantum of punishment to be awarded in a given case. Senior Advocate Siddharth Luthra, appearing for the State per contra argued that Section 364A of IPC was a validly enacted piece of legislation. He referred to 42nd Law Commission Report, The Criminal Law (Amendment) Bill 1992 introduced in the Rajya Sabha as also the Statement of Objects and Reasons of the Bill for introduction of Section 364A and contended that kidnapping innocent persons for ransom had become rampant and called for strong legislative measures to root out the malady. This could be done by providing heavy penalties for those indulging in such nefarious and barbaric acts. He also referred to the International Convention and the Report of the Committee of Home Affairs in support of his submission that Section 364A was amended in the year 1995 to fulfill India's commitment towards the international convention signed in 1994 by providing for severe penalty for those engaged in acts of violence and terrorism against the State, any foreign country or any international organization. Full text of the Judgment is available here. Supreme Court declared Section 27(3) of Arms Act, 1959 ultra vires the Constitution on the ground that it imposes a mandatory death penalty which violates Article 14 and 21 of the Constitution. In Mithu v. State, Chief Justice Y.V. Chandrachud giving the majority opinion held that the sentence of death, prescribed by Section 303 of IPC for the offence of murder committed by a person who is under a sentence of life imprisonment is a savage sentence and this Court held that the same is arbitrary and oppressive being violative of Articles 21 and 14 of the Constitution.